Is This A Fabulous Soup Or What? I love this site that this recipe came from…Tasting Table. A sweet newsletter comes daily with restaurants, wine ideas, and sometimes amazing recipes by a fabulous chef. This was in today’s newsletter. Thank you, Chef Bull!!! 1. In a medium saucepan, warm the oil over medium heat. Add the pepperoni and cook, stirring occasionally, until it’s lightly browned, about 8 minutes. 2. Add the onions, celery, garlic, basil, parsley, oregano, garlic salt, celery seeds and red-pepper flakes and cook, stirring occasionally, over medium heat until the onions are tender, about 8 minutes. 3. Add the tomato puree and cook over medium heat, stirring, for 2 minutes. Add the wine and reduce the liquid by half, about 2 minutes. Add the tomato juice, tomato sauce and 1 cup of water. Bring the soup to a boil. Reduce the heat to low and simmer for 20 minutes. 4. Remove the soup from the heat and season to taste with salt and pepper. Divide among 4 bowls and top with the mozzarella and croutons. Serve immediately. 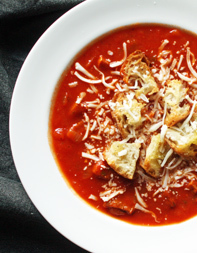 Patty-This soup really sounds great, I happen to have pepperoni, and mozzarella on hand, and will try it!